Pilates is named after Joseph Pilates (right, training his neice). Born in Germany in 1880, his childhood was plagued by asthma, rickets and rheumatic fever. But he was determined to overcome his ill health. He studied many approaches to exercise and picked out the best aspects to achieve good alignment with a balance between strength and flexibility. He began to teach what he had discovered. His New York studio became popular with dancers and subsequently spread to sports people and the rehabilitation of injuries. Physiotherapists use many techniques to correct muscle imbalance and faulty patterning. Pilates is one method that is quickly rewarding when practiced properly - and it’s fun to do in a class situation. Pilates aims to improve the stability of your back, pelvis and shoulder girdle – your core or centre – to give you a strong base to work from. 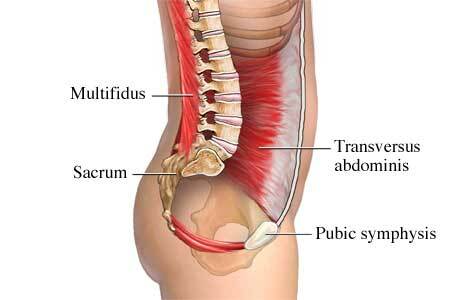 The muscles that are important for this are transversus abdominus (TrA), a deep abdominal muscle which wraps around the trunk like a corset; multifidus which is made up of short straps of muscle running between several vertebrae; the diaphragm above them and your pelvic floor muscles beneath. The gluteals (buttocks) and trapezius in the shoulder are also very important. When these contract, they form a cylinder of pressure around the spine. Research has shown that, following back pain, multifidus often stops working properly and requires specific retraining to recover. Multifidus is made up of small deep postural muscles that are designed to work continuously at a low level. If these muscles are not working efficiently, larger mobilising muscles have to take over the role of stability. These larger muscles are designed to produce movement and to work only occasionally. If they have to work hard at stabilizing, they get fatigued when they are asked to produce movement and are more likely to fail. This can lead to injury as the spine relies on its muscular system for stability. (It may also be one reason why back pain is so often recurrent). Stability exercises such as Pilates can help with retraining. Postural muscles should only be worked at 20-30% of their maximum ability to enable them to work for long periods. Pilates exercises should never produce pain. You should always be able to breathe easily and be able to talk. If you are struggling with an exercise, your instructor will help you to drop back to a level that was not a struggle. 1. Relaxation – releasing everyday tension and unnecessary muscle work through postural adjustments and mental focus is an important start to exercise. 2. Concentration - this is vital to achieve an awareness of what your body is doing. As certain movements become automatic, concentration enables you to focus on other aspects of the exercise. 3. Breathing – this is co-ordinated with exercises to encourage correct muscle recruitment and provide greatest stability during the most challenging part of the exercise. 4. Centring – your centre is your ‘powerhouse’. Pilates promotes core stability. Exercises gradually challenge stability, developing an effective powerhouse. 5. Postural alignment – constant reminding of correct posture and movement in many positions helps to restore muscle balance and alignment. Most exercises are performed with the pelvis/spine in a neutral position. 6. Flowing controlled movements – we aim for slow, smooth, continuously flowing movements, performed gracefully with control to gain alignment and body awareness. 7. Isolation – each movement should be focused and purposeful so that the action is precise and correct movement patterns are used. Repetition of good patterns brings greater skill and increases the benefit. 8. Stamina and strength – as your ability to do the exercises with good breathing improves, you should find that your stamina increases. When your core stability improves, we move on to challenge this with longer levers, weights, unstable bases and resistance to add strength.